Hi everyone. Good news, Santa has come early this year – we have just unwrapped a few new features for you! Check out the details below. OK, OK, you’ve all been asking us for this one for quite a while. Now you can display the most recent house sitting (or house sitter) listings first – just tick the ‘Show most recent listing first?’ checkbox on the search page. Home owners can also restrict their search by only showing house sitters with references. 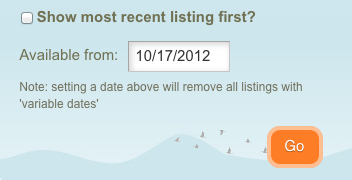 And house sitters can now restrict their search further by setting a ‘Available from’ date. Pets are so very popular amongst our home owners. They’re quite needy too. So why didn’t we have a field in our database for Pets? Hmm, not sure, but it’s there now. We strongly recommend that all house sitters edit their listings (https://www.mindmyhouse.com/sitters/advert) as soon as possible and update this new field. It’s a simple text field that gives you the flexibility to describe your amazing pet sitting skills and experience, if you have any. 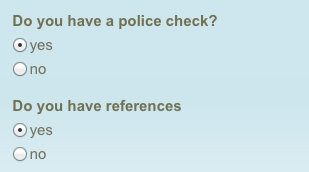 Attention all house sitters, Police checks are becoming increasingly very popular with our home owners. If you’ve gone to the trouble of getting one of these, there’s a new field in our database for this. Just edit your listing (https://www.mindmyhouse.com/sitters/advert), and tick the ‘Do you have a police check?’ checkbox, in the ‘Availability & References’ section. And Home owners, we have good news for you too – we will give you the ability to find and contact house sitters who only have a police check after a few months (once our house sitters have had a chance to update their listings). And we have also added a ‘References’ filter as well, so that you can only find house sitters who have references. Ok, so we’re not perfect. There were a few minor problems a while back, specifically around being logged out and problems saving your advert. We are fairly confident now that these issues are sorted. If they are not, please drop us an email and we’ll investigate further. As everyone knows, it’s the holiday season coming up. That means it will be busy for our house sitters out there. Although not everyone wants to be away from home and family for Christmas, some eagerly welcome the opportunity to escape! If your traveling north from the southern hemisphere (where it’s summer) be prepared for the cold. And visa versa, of course. What’s it like to be at the Coal Face (aka Support desk)? Many of you, whom have contacted customer support over the years, would be instantly familiar with Susan, our intrepid Editor. What you don’t know is that as MindMyHouse has grown, so has her workload! We get alot of emails coming in on a daily basis on a huge range of subjects, so much that it’s difficult to respond to everyone. She does try though. It’s not an easy job for Susan – I’m sure that more people write in to complain than to praise, but she copes very well! As we approach our eighth year soon, we congratulate her on a marvelous effort! Well done! And in case your wondering why Susan isn’t writing this edition of MindMyHouse news, she’s too busy over at Customer support! The designer/developer at MindMyHouse is a more 'quiet' character than our chatty editor Susan. Alan is always knee deep in code, trying to do the best by our users but not always succeeding. He recently emigrated with wife Susan to the greener pastures of New Zealand from Australia, where he grew up (with courtesy suntan, of course). He may now be spotted occasionally waving an All Blacks flag, or following his daughters around the soccer pitch.